For individuals or families that have been searching for a luxury camping site which offers relaxation alongside numerous exciting activities, Isamar Holiday Village is an excellent choice. Nestled on the southern shores of a Venetian Lagoon and boasting views of the Adriatic Sea, luxury camping has been taken to the next level thanks to the amenities provided here. Should you wish to learn further details or to book your next excursion, please contact Lux-Camp. One of the benefits offered by this camping holiday is that all visitors can enjoy nearly limitless activities during their stay. Some of the most popular include a complex of four swimming pools (equipped with water slides), table tennis, a nearby golf course and a mini disco theatre designed for children. For the convenience of all parties, these and other facilities are located quite close to the bungalow tents and mobile homes on the pitches themselves. 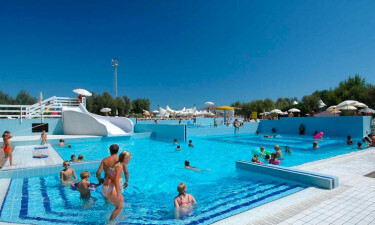 What are the reasons to consider Camping Isamar near Isolaverde-Chioggia for an upcoming holiday camping site? 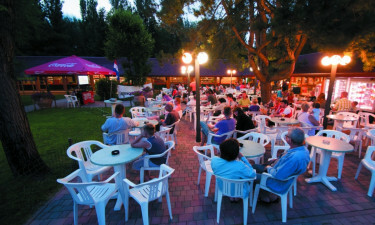 Not only are there multiple ice cream shops and gift centres, but Restaurant La Cabaña is located within the holiday camping site itself. While the food here is not to be missed, this restaurant also doubles as a disco and dance hall; offering entertainment and cocktails until the wee hours of the morning. For additional supplies, a well-stocked supermarket, a fish stand and a local bazaar are all found within a short distance from camp. Offering local and regional foods, families will enjoy competitive prices and a host of different foods to choose from. If more details are required in regards to this luxury camping site, please feel free to contact Lux-Camp directly.